2007 U.S. Open 9-Ball Championship . Oct. 20, 2007 . Chesapeake, Va. In the few months since Shane Van Boening's triumph at the 2007 U.S. Open, we've learned that the significance of this final might be told in the years to come. The 24-year-old, barely a rookie on the professional circuit, put the world on notice that his time was approaching - and might have just started. Whether or not he was the savior of American pool as some claimed, Van Boening remained in stroke for the rest of 2007, winning the Reno Open and asserting himself at the Mosconi Cup. The secret about the "The Kid" from South Dakota was out before the U.S. Open, with Van Boening finishing second at the EnjoyPool.com 9-Ball Championship in May 2007, then winning the Predator 10-Ball World Championship a week later. But this was the perfect stage for his coming out party. His opponent in the final was reigning world 8-ball and 9-ball champion Ronnie Alcano, whom Van Boening dominated in an earlier matchup at the 2007 Open, 11-4. 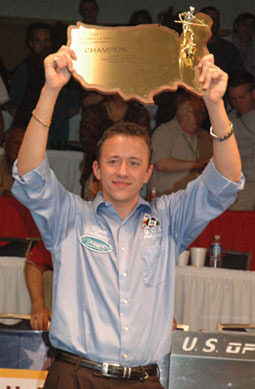 Van Boening topped the world champion to hoist the Open hardware. In the race-to-13 final, the two lanky, unassuming stars split the first 16 racks. That was when Van Boening displayed his newly refined defensive game. The American pulled away by repeatedly forcing his Filipino counterpart into fouls. For example, up 10-9, Van Boening pulled off a jump-kick safety that buried both the cue ball and object ball. His nonchalant exterior eroded only in the final rack. Running through a routine layout, Van Boening cracked a smile on his way to the title-winning 9 ball. He dropped it in the corner pocket and raised his cue above his head as the U.S. Open champion. "It feels really good," Van Boening said moments after his victory. "This is what I've been waiting for my whole life." Not the most outspoken champion, Van Boening's play might have been best summed up by former U.S. Open champion Gabe Owen. "It looks like this is what he's born to do," Owen said.